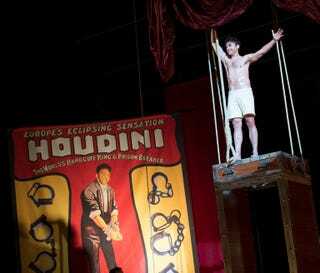 This Week's TV: What the Hell is Houdini & Doyle? Harry Houdini and Arthur Conan Doyle team up to solve mysteries in a British-Canadian-U.S. co-production you’re probably only just hearing about! Person Of Interest’s fifth and final season! And what are these continuously promised deaths on Agents of SHIELD and Once Upon A Time? Let’s figure it out, on This Week’s TV! There’s a very good “circles for eyes” effect in this promo—very Batman: The Animated Series. Series premiere! Harry Houdini and Arthur Conan Doyle team up to solve mysteries. I had not heard of it until just now, either! It’s the season five premiere! Eleven seasons and they haven’t done “madness fog” yet? Beginning with The Grandmother at two in the morning.